Toyota's all-new 2012 Le Mans 24 Hours contender hit the track for the first time last week for three days at Paul Ricard. The driver line-up is believed to be Alex Wurz, Nicolas Lapierre and Kazuki Nakajima. Toyota will field a solo entry at Le Mans this year and the petrol-electric hybrid LMP1 sports prototype will alos contest selected rounds of the FIA World Endurance Championship. With Peugeot cancelling it's entire race program within a week of Toyota's first test, the only other works team racing for the first Hybrid win at Le Mans in 2012 will be Audi with their Diesel hybrid. 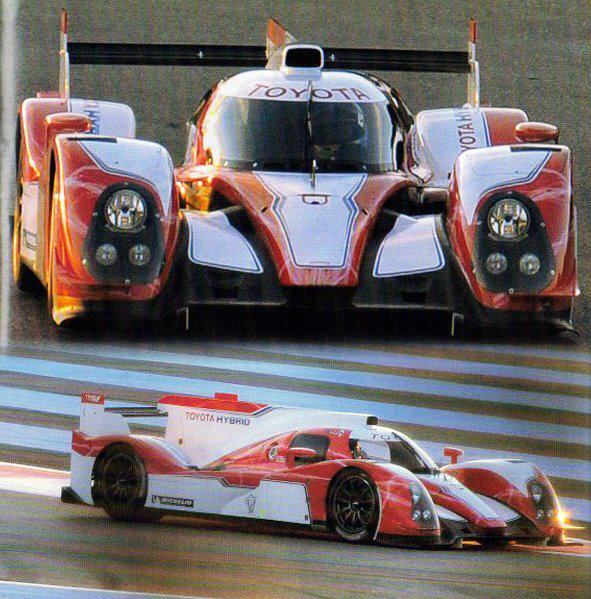 Last year Toyota seriously outclassed Peugeot at the Nurburgring. In April Peugeot had a crack at the EV track record with their AWD EX1 electric concept car setting a time of 9 mins 01.338 seconds, slower than a road registered STi WRX. Toyota launched their EV record attempt in August and achieved 7 mins 47.794 seconds. Perhaps Peugeot were looking to avoid similar embarrassment on home soil.